The 2015 Hyundai Sonata appeals to a wider range of customers than ever before. From the base model 2015 Sonata 2.4-liter to a new range-topping Sport 2.0T Ultimate that offers class-above features such as hands-free smart trunk, smart cruise control, panoramic sunroof, heated and ventilated seats and a heated steering wheel, the 2015 Sonata aims to please. Confident, energetic lines define the 2015 Sonata’s exterior and are complemented inside the cabin by a premium interior with a special emphasis on ergonomics. Intuitive buttons and controls are placed on the center stack, which is angled toward the driver to make the controls easier to reach. Hyundai’s core interior design principles are safety, intuitiveness and simplicity and the Sonata delivers. To create a unified experience inside the cabin, designers met with various suppliers to make sure all buttons and switchgear have a consistent feel. The height of the display screen for the audio display or 8-inch navigation system and instrument cluster are optimized for visibility and reside on the same plane to enhance readability during a quick glance. These ergonomic enhancements help the driver remain focused on the road ahead and provide confidence behind the wheel. A larger, more refined grille with a wide air intake defines the face of the 2015 Sonata. Simple, harmonious lines adorn the exterior while hinting at the improved dynamic performance and human-machine connection Sonata provides. Taut, horizontal rocker panels reflect the chassis’ increased stability and surefootedness while the signature Sonata beltline is now stretched tight to accentuate the sedan’s strength. The coupe-like roofline remains, but it is balanced by a larger window graphic that emphasizes the roomier interior. Horizontal lines in the rear underscore Sonata’s width and give the car a planted look. Shoppers looking for a traditional design will appreciate the 2015 Sonata SE’s exterior styling that includes standard LED daytime running lights, 16-inch alloy wheels, a rear lip spoiler and chrome surround for the day light opening. 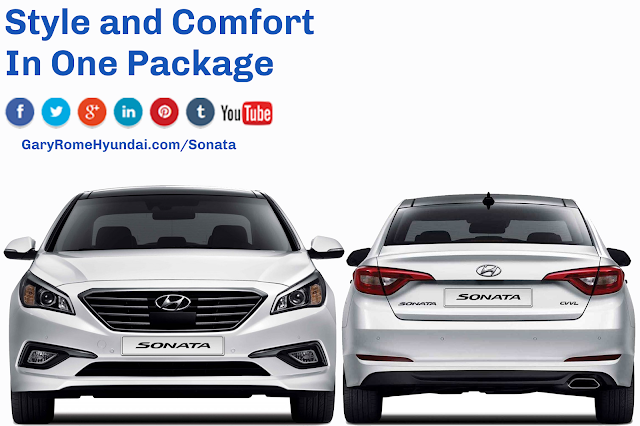 Sonata Sport features a more aggressive front grille and bumper, side rocker extensions and side chrome molding. Sport models powered by the 2.4-liter four-cylinder engine feature dual exhaust while Sport 2.0T models feature a unique rear bumper fascia, quad exhaust tips and 18-inch alloy wheels. The Sport model is expected to be the most popular Sonata. The 2015 Sonata embodies Hyundai’s Modern Premium brand direction by providing convenient technology formerly reserved for luxury sedans in the mid-size segment without the premium price tag. Switching the high beams on and off manually doesn’t seem like a hassle but Sonata’s high beam assist allows the driver to keep their eyes on the road and let the headlamps deliver maximum visibility without accidentally blinding oncoming traffic. Bright LED daytime running lights give the 2015 Sonata’s face a premium look. Smart trunk gives drivers a convenient hands-free way to open the trunk while keeping both feet firmly planted on the ground. The owner simply needs to approach the Sonata’s trunk with the key fob in a purse or pocket and wait three seconds. The trunk will automatically open, making it easy to place groceries or luggage inside when hands are full. The 2015 Sonata is rated as one of the safest cars on the road today. The 2015 Sonata was named a 2014 TOP SAFETY PICK+, when equipped with optional forward collision warning, by the Insurance Institute of Highway Safety (IIHS). The 2015 Sonata brings a new level of safety and refinement to the midsize sedan category. IIHS rates vehicles in a moderate overlap front crash, small overlap front crash, side impact and rollover test and evaluates seat/head restraints for protection against neck injuries in rear impact collisions. Additionally, IIHS evaluates available front crash prevention systems that aim to prevent a crash or lessen its severity. Winners of the TOP SAFETY PICK+ award must earn Good ratings for occupant protection in the moderate overlap front, side, roof strength and head restraint tests, no less than acceptable in the small overlap test, and at least a basic rating for front crash prevention. Sonata’s suite of safety features aims to help prevent accidents and maximize the safety of its occupants in the event of a collision.